Swara Yoga is a science of nasal breathing used for whole brain training. It is also ancient science of success based on 395 Sutras of Shiv-Swarodaya Shashtra. 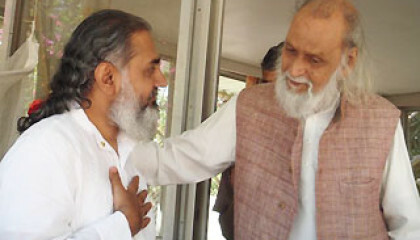 Knowledge and healing techniques of Swara Yoga can be easily harmonized with other healing therapies. It is excellent tool for body, mind, emotions and karma healing. You can also improve Brain Power and Memory with few simple techniques from Swara Yoga. It is practical and easy to use in day to day living for modern man. The word SWARA means the continuous flow of air through one nostril. And YOGA means union. So Swara Yoga is the science which is about the realization of cosmic consciousness, through the awareness or observation of the flow of breath in the nostrils. Swara yoga is an ancient science existing since before the Vedic period, over ten thousand years ago. It was a secret science, only available for the select few, especially kings and dedicated seekers. It was kept as a closed secret by the ancient sages and saints who had intuitively received this knowledge from the Divine. Swara yoga is a tantric science coming from the Agama Shastras and from Shaiva Tantra, where Lord Siva is the guru and Shakti is the disciple She asks questions about nature and the governing forces of the universe. 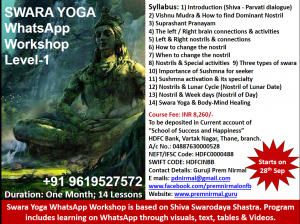 Lord Siva gives this precious knowledge of swara yoga to Shakti. Swara yoga involves the systematic study of the breath flow through the nostrils (or swara) in relation to the prevailing phases of the moon, time of day and direction . Although we think of ‘pranayama’ when we think of techniques associated with the breath, in Swara yoga, it is the association of the breath in relation to the activities or phases or positions of the sun, moon, planets, seasons, time of day, with the physical and mental conditions of the individual and then taking the appropriate action according to these subtle relations. For example, knowing the moon phases and checking the flow of your nostrils before you get out of bed in the morning and letting the corresponding foot be the first to touch the floor and make the first step, is a simple practice that ensures success in everything that happens for that day. The first foot to touch the ground will get the prevailing ‘successful’ flow of energy from the cosmos. What are the advantages of learning Swara Yoga? The swara yoga practices related to breath were used to understand the governing forces of life, to understand the nature of the universe and effects of the elements on body and mind by observing the different patterns of breath. Further, it was used to go beyond the limitations of the mind. The fascinating thing about Swara yoga is that just by being aware of the swara (dominant nostril) in relation to the environment, you can manipulate the results of what you are about to do. In other words, you can find out which is going to be the successful route and then follow it. It can be as simple as checking your nostrils before setting out of the house, noting the direction you wish to go in and then choosing the appropriate foot with which you will make your first step, to ensure success and positive outcomes for everything that follows thereafter. You learn to do right thing at right time. You can bring balance & order in your life. You learn to be relaxed & conscious of own state of being before starting an activity. You learn to live in constant awareness of your inner & outer world. You learn to attune to natural rhythms & universal laws for greater health & wellbeing. Those who practice swara yoga never suffer from failure & discontent. You learn how to change the vibrational pattern of the environment to your advantage. Through the knowledge of swara yoga one can become free from all kinds of negative influences of one’s destiny and can achieve heightened awareness. Through swara yoga you learn physical & psychic healing. The knowledge of swara yoga helps you to get liberated from the cycle of life & death. 1) You will get full knowledge of 395 Sutras of Shiv Swaroday Shashtra. 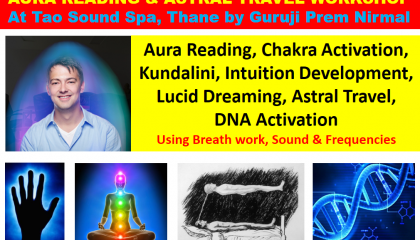 Energy Exchange: Rs.40,000/- + 18% GST = Rs.47,200/- Includes Stay, food, stationery, training manual, work-sheets and practical training by Guruji Prem Nirmal, in a small group. For more info and Registration confirmation, Contact +91 9619527572 on WhatsApp. Venue: Pyramid Ashram, Plot No. 63, Maha Ganapati Society, Kolum Village, Kalyan-Murbad Road, Dist. Thane. Pyramid ashram is located away from hustle and bustle of the mega city Mumbai – amidst lush green forest on Kalyan-Murbad Road. The ashram is well equipped with tastefully designed Pyramid cottages ideally suited for meditation. Pyramid Cottages are surrounded by Mango, Guava, Chikoo, Cashew, Ramphal, Sitaphal, Banana, Papaya, Gooseberry (Aamla) and Mulberry trees that attract many birds and to be in “Expanding Awareness” is easy while listening to songs of birds! Pyramid ashram is designed to be an “International Retreat Center” with a conference room with audio video facilities. 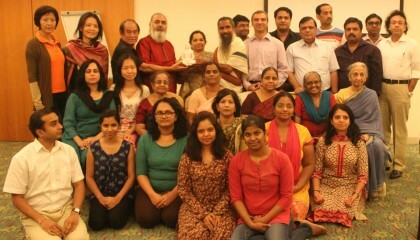 Many participants from world over come to attend various retreats for intense learning. You can enjoy organic farm fresh fruits and vegetables, herbal drinks, veg. 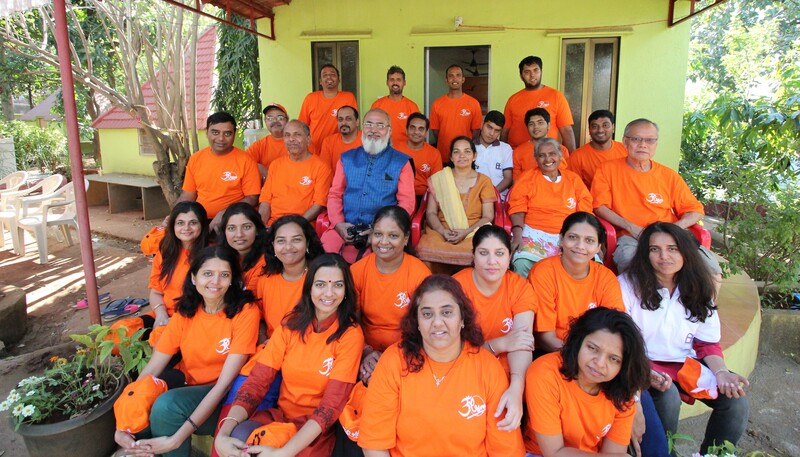 meals and learn from nature at Pyramid Ashram in silence or enjoy intense learning during various camps organized from November to March every year. 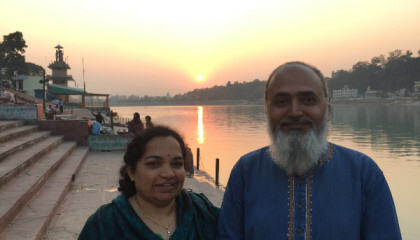 During November to March, the day temperature at ashram varies from 20 to 30 degrees Celsius while night temperature varies from 10 to 20 degrees Celsius. 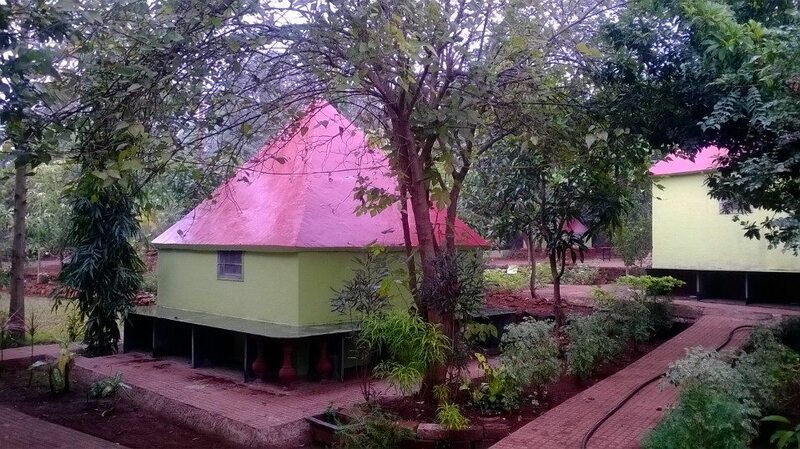 Pyramid Ashram has well designed Water tank for Karmakshalan Water Kriyas and has Yagya-shala for fire ceremonies. Energy of Pyramid Ashram is amazingly conducive for spiritual growth and hundreds of participants from all over the world have reported awesome healing and rejuvenation results in various residential retreats. 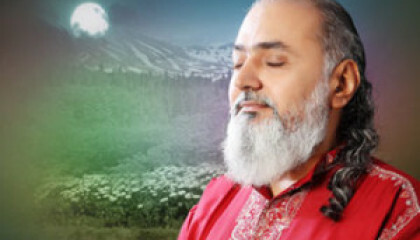 How to reach Pyramid Ashram? People coming from Mumbai Airport can take pre-paid taxi service for drop to Pyramid Ashram. People coming by train can get down at Kalyan Junction (Central Railway) and take an auto or Jeep going towards Murbad, to get down at Kolum Village which is 14kms from Kalyan on the way to Murbad. Those who want to drive down to Pyramid Ashram from Mumbai / Thane can take following rout: Mumbai Eastern Express High way – Thane Toll Naka / Check Naka – Turn right over bridge to Nasik Highway – 15kms – Turn right at Kalyan Naka – Birla College – Over Shahad Bridge – Birla Gate (Century Rayon Company) – 12kms towards Murbad. Turn left at Kolum village to reach Pyramid Ashram. 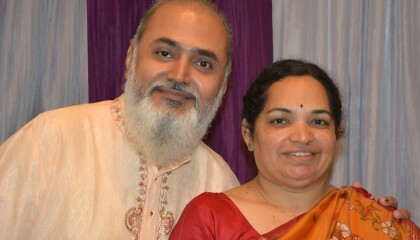 I have done basic course of Swara Yoga with you at TAO in Thane . I am practicing swara yoga in day to day activities. Is there any discount in fees ? Or Can I join the course on 15th Feb Morning. Presently I am staying in Vizag, Andhra Pradesh. This is Teacher’s Training so basic workshop is pre-requisite. I request you attend all days so as not to miss on basics of how to teach Swara Yoga. Please let me know when is the next batch starting for Swara Yoga. I am from Chennai location and i am very much interested to learn. I am from hyderabad location and i am very much interested to learn. Thank you Guruji for creating this opportunity and for great gift. I will enroll as earliest. I am very much interested in Learning Swar yoga. Please let me know Course Date and formalities required to attend course.